Situated in Bad Grund, this hotel is within 12 mi (20 km) of Osterode Old Castle, Old Town Hall, and Gustav Adolf Stave Church. Abbey Church and Oker Dam are also within 16 mi (25 km). Situated in Bad Grund, this bed & breakfast is within 12 mi (20 km) of Osterode Old Castle, Old Town Hall, and Gustav Adolf Stave Church. Oker Dam and Abbey Church are also within 16 mi (25 km). 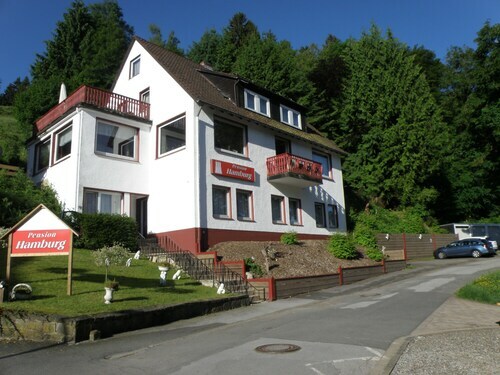 Situated in the mountains, this guesthouse is 9 mi (14.5 km) from Osterode Old Castle and 9.2 mi (14.8 km) from Old Town Hall. Oker Dam and Abbey Church are also within 16 mi (25 km). Situated in a rural location, this hotel is 8.6 mi (13.8 km) from Osterode Old Castle and 10.5 mi (16.9 km) from Gustav Adolf Stave Church. Oker Dam and Mines of Rammelsberg are also within 25 mi (40 km). How Much is a Hotel Room in Bad Grund? 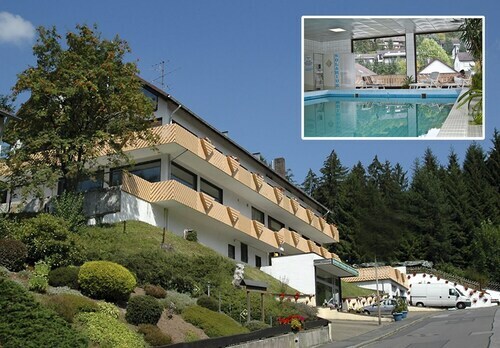 Hotels in Bad Grund start at $48 per night. Prices and availability subject to change. Additional terms may apply. There are a range of rooms on Travelocity to choose between when you're ready to start planning your vacation in Bad Grund. Travelers can book approximately 12 hotels and apartments within a convenient drive of of Bad Grund. Bad Grund offers modern visitors a variety of modern hotels, including the Hotel Pension am Kurmittelhaus and Kur- und Sporthotel Alter Römer. The Hotel Freigeist Northeim is 12 miles (19 kilometers) from downtown Bad Grund. An alternative accommodation option is the Hotel Riemann, which is 16 miles (26 kilometers) away. 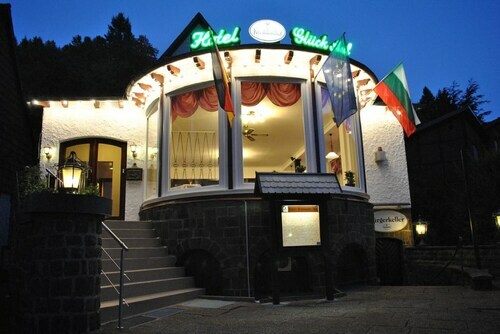 Alternate hotels include the Harzhotel im Tannengrund and the Hotel & Restaurant Zum Röddenberg. Once you and your family have found the secrets of Bad Grund, why not tour a little bit more of the region? The Saxony-Anhalt area is home to many things to offer tourists. Saxony-Anhalt proudly boasts forests and rivers. Frequented vacation destinations are castles, old towns and fortresses. Visitors and locals alike in this part of Germany often enjoy snowboarding. 10 miles (16 kilometers) to the northeast of Bad Grund, you will find Goslar, which is where you can visit Goslar Imperial Palace and Mines of Rammelsberg. The Altstadt Hotel Gosequell and RAMADA Hotel Baeren Goslar are just some examples of the Travelocity hotel options in Goslar. 20 miles (34 kilometers) southeast of Bad Grund, you'll find Sorge, home to the Hotel Tannenpark and Landhausferienwohnungen Am Brockenblick. The Grenzlandschaft and Museum Sorge and Ring der Erinnerung are some more frequented points of interest to get to know in Sorge. Make sure you get your serving of local sport by making the journey to HDI Arena, which you will find 45 miles (70 kilometers) to the northwest of Bad Grund. Wise visitors that want to stay nearby can look at the Cityhotel Königsstraße or the Sheraton Hanover Pelikan Hotel. When you're flying into or out of Hannover Airport and are looking to book Travelocity-listed accommodation in the area, consider Leonardo Hotel Hannover Airport or Maritim Airport Hotel.